This post is an excerpt from the latest edition of our Catalytic Converter monthly (link), published on 25 February 2015. As the Big Oil year-end 2014 reporting season draws to an end, we reflect on the main messages from the strategy updates. The number 1 theme to emerge from the European and US majors’ full-year 2014 results presentations/annual strategy updates was the reduction in capital expenditures for 2015. Capex cuts for the group were broadly in line with expectations, coming in at c 13% y/y on average and c 15% vs previous guidance (which assumed small capex hikes). The biggest y-o-y declines in percentage terms were at BG, Eni and BP with 13-31% cuts. By contrast, well-capitalised supermajors Shell and Exxon expressed a desire to not “overreact” to lower oil prices, and are likely to reduce 2015 spend only by mid- or high single digits. US tight/shale oil and gas drilling, especially outside core liquids-rich areas. Service costs to fall: majors see significant opportunities to reduce costs throughout the value chain, both in terms of their own internal cost bases and suppliers’ costs. However, cost deflation in the supply chain typically takes 6-18 months to flow through to majors’ capex budgets, given the amount of committed capex, eg on rigs and projects in construction. Service contract renegotiations started in late 2014 and are still in early stages. Majors are expecting cost reductions of the order of 20-30% over time, based on previous cycles. Cost deflation should be visible first in drilling rigs and seismic, while offshore equipment and installation will take longer to react as contractors complete work on their backlogs. Regionally, the US onshore will almost certainly be more reactive than other regions given shale’s short-cycle nature. We would not be surprised to see all majors attempting to lock in lower service costs at the same time in 6-12 months, leading to a sharp recovery in service pricing. Exhibit 2: In the 2008-09 downturn, service costs fell 10-20% on average. How much will they fall this time? Source: Total September 2014 Investor Day, IHS CERA. Note: *Capital Cost Index and Upstream Operating Cost Index. Similar to previous downturns, the integrated oils are prioritising dividends over other uses of cash in their financial frameworks. At all majors, dividends were kept flat for 2015 despite lower cash generation, with free cash neutrality (post dividend) expected by company managements to return by 2017 at $70-80/bbl. Theme 4: M&A strategy – if majors are not countercyclical, who can be? Acquisitions not the priority for now: from their language on Q414 conference calls, majors appear more keen on divesting assets than buying assets. 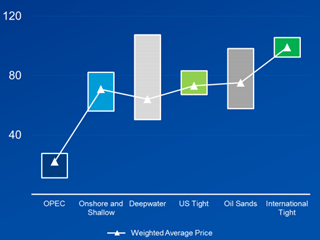 We do see potential for majors to opportunistically pick up assets or acquire small-cap E&Ps, either to reinforce their presence in existing areas, or as a way to enter new regions such as North American shale or international exploration hotspots. Still in “shrink-to-grow” mode: Shell, BP and Total are each targeting c $5bn of divestments in 2015 and CVX is targeting $4bn over 2015-16. Majors’ disposals target may be difficult to achieve this year as many buyers lack financing capacity. It seems to us that only Asian and Middle-Eastern NOCs could still be in a position to buy assets from the majors these days. 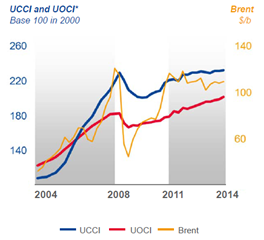 Majors booked a combined >$24bn of impairments in Q414 on the back of lower oil prices, largely (c 90%) in upstream. BP, Total, and BG each took around $6bn of impairments, Statoil $3bn and Eni $1.3bn. By contrast, Shell, Exxon and Chevron chose not to book large impairments, arguing that their long-term oil price views were unchanged. Importantly, companies have some leeway to determine impairments under accounting rules. Under IFRS, companies have to compare the carrying value of their assets with the expected future cash flows or resale value of the assets. In this process, they can choose to use either their internal assumptions or forward curves. For short-term projects (eg infill offshore wells in the North Sea, US shale wells), two-year forward curves are presumably more appropriate than internal assumptions. Longer-term projects starting up in 2020+ may not see their value impaired at all. Impairment tests typically have to be triggered by an identifiable “event”. A decline in commodity prices is not necessarily considered to be a trigger event in itself; however, a downgrade to reserves (which may be caused by lower prices) may be a sufficient trigger.